Did the title of this article catch your eye? As you may already know, there are only 150 Psalms in the Bible. But when my son wrote and sent this poem to me (copied out below), I felt like it should belong in the Bible as an additional Psalm. 🙂 I hope you will enjoy reading it and find it encouraging to your faith. As I read it, I was so impressed by his poetic style and his command of good imagery. But I also saw that it showed throughout his positive faith in God and his Christian character. Which is amazing for two reasons: 1) In previous years, Glen wrote many other poems. He has exercise books full of them. But so many of them were dark as he went through some difficult months of feeling lost. And 2) Glen is currently training with the Canadian military, which is not a godly environment. As you read the poem, you can see the “potential enemies” around him, and yet his faith is carrying him through as he works within a very strong non-faith environment. I am very proud of him, as well as being proud of my other son, Eric, and his wife of 3 1/2 years, as they all remain true and fast to their faith in Christ and their devotion to God the Father. Am I your child God? Do I have your favor? Do not abandon me in your anger. Do not throw me away in your wrath. Trampling the honest and holy ones? Who is left that Believes? I, a lowly creature, am not worthy. In your love and safety. In times of trouble, to you I turn. When I am blessed, to you I give thanks. You bent low and decided to create me. Holy and righteous in your eyes. Lead me in the steps of everlasting life. Thank you Father, for this life. Yet you hold no debt over me. I am free, by your blood. So let me be free in your power. I am surrounded on all sides. They wish to devour my flesh. Rescue me from my imminent Death, Oh Lord. There is none before, there is no end. Called me like I am your child. Father, my God, how majestic is your Name. Forgive us Lord, For our blindness. We are a Deaf, Blind, Dying race. Oh Lord, My God, Have mercy on me. For all I have done for your children. To soar above my enemies. I will have victory, over my foe. For the Lord is with me. Strength and power are his. The world bends to his call. Had the Lord not created the wolves as well? I will bring aid for your wounds. Let my life be an offering to you. Let my sacrifice and burnt offering be a pleasing aroma to you. May I serve you with integrity and excellence. And may your Word ever be on my lips. Till the last breath, I serve you. Allow me one more time to commend what is written above. I am currently preparing to do the consultant check on 1/3 of the book of Psalms for a language group over in Papua New Guinea. As I have been studying all I can about psalms, I learned that there are seven key elements found within what is called a “Petition Psalm” also known as a “Lament Psalm”. 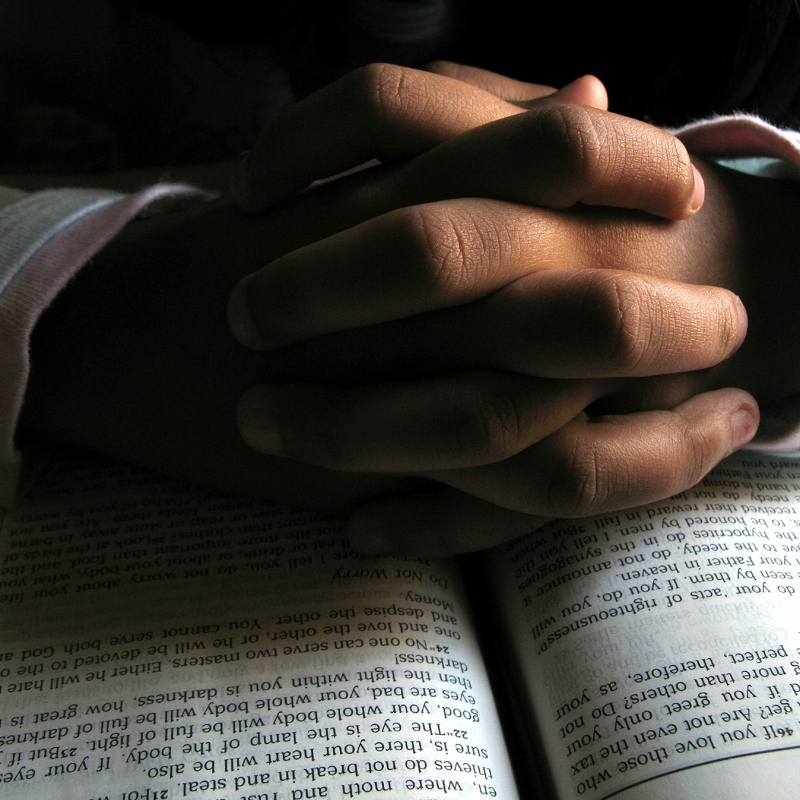 Appeal: the Psalmist calls to God to listen and pleads for help in a time of trouble. Problem: greater detail is given regarding the problem that he is facing. Request: what the Psalmist wants God to do in order to help deal with the problem. Confession: his claim of innocence and/or a confession of sin before a holy God. Profession of Faith: a strong statement of belief in God, who He is and what He can do. Promise: a vow to praise God, serve Him, and/or a promise to bring God an offering. Praise: a final word of praise or trust in God. In the last article of this series, we left off at the point in 2007 where we were able to reunite our family of four. For about three months, we were actually split up into three places when Glen went back to Canada. Jill and I stayed on in East Africa to finish our administrative duties, Eric had stayed in the basement suite of some friends, and Glen room-and-boarded at the home of some other friends of ours in Calgary. But God brought us all back together as soon as we returned from Africa. What was so neat was that in March when I brought Glen back to Canada, I overheard a friend say to his wife that he wished he could find some good tenants for his condo rental, and that led to us having a place to move into immediately when we returned to Canada ourselves. 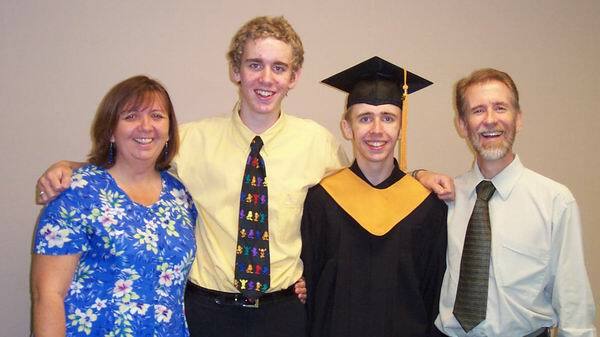 And just as immediately, our two sons moved in with us and we were all together again. So that got our family settled. Jill was able to get hired right back on to the same unit at the hospital (which happened to be directly across the road from our apartment). Eric was going to take a year of classes at our local Bible college, and Glen had his Grade 12 year of online schooling to do. And that gave direction for our boys. Which kind of meant that I was left hanging, not knowing what I was supposed to be doing. It turned out that the answer for what I should do next came rather quickly. 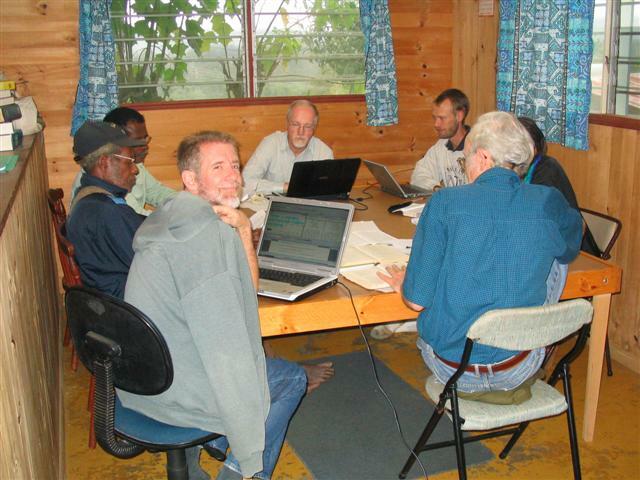 An invitation by email came to me from our Papua New Guinea Branch to consider coming over there in August 2007 so that I could attend a six-week course to be trained to become a Bible Translation Consultant. This meant leaving the family again within weeks of coming back from Africa, but Jill encouraged me to get this training since we didn’t really know yet what lay ahead for us. The time went quickly, and it seemed like suddenly there I was, back at the mission base that we had so hastily evacuated as a family five years before when Eric began his cancer journey with leukemia. (You can read about that story here.) Now I am not known to be a real emotional guy, but I must admit that for many days I had tears in my eyes as I went around the mission center and memories came back to me of our time as a family there. But those were tears of joy now, not tears of grief and despair. And I knew that God was healing a part of me that had been seared with pain when I saw my son so sick back in 2002, and as I also realized that our ministry in PNG had come to an end. But God is so good, and He not only healed me of the past, He also gave a brand new future to me. I was there to become a Translation Consultant. Let me explain for a minute the importance of the training I was about to receive at this course in PNG. The goal of everyone in our mission, Pioneer Bible Translators, whether directly or indirectly, is to get the translated Word of God into the hands of the local people in a language that speaks to the hearts of the people. So we start the process by making an initial rough draft of the Scripture portion we are working on, and after a lengthy period of testing and revising, we bring that portion to the trained consultant for a final check before the Scripture can be published. The problem is that we see more Scriptures being prepared for the consultant checking phase than there are consultants available to do the actual checking. We have had a serious bottleneck over the years of backlogged material ready to go forward, but very few consultants to come check the translations. So I was eager to get this training, not just so I could become a consultant, but because I saw the importance of doing what it took to help out to get this backlogged material through. I must say now as I look back on that training, that I think I felt more fulfilled in this experience and in the direction it was taking me than in just about anything else I have ever done. All of a sudden I realized how all of the experiences of my life had added up to this moment of becoming a Bible Translation Consultant. Obviously the five years we had done translation work in the remote village of PNG gave me excellent field experience to draw on. But everything else made sense too. The theological training from Bible college and two seminaries helped prepare me to do good exegetical inquiries into the translations. The linguistic training helped me to probe the translations grammatically and semantically. All my cross-cultural experiences helped me to ask good culturally sensitive questions. And the 5 years of pastoral work back in North America helped me to see how the translated Word of God would evangelistically impact the people who would receive the translated Scriptures. Certainly there have been a lot of things that I have thanked God for Him bringing into my life. But I think the translation consultant training would rank as my best experience of my entire life. And after it was over, and when I actually got to use the training in February of ’08 back in PNG, I knew I had found what I had always been looking for. So as I turned 47 that year, I guess I finally answered the question of what I wanted to do when I grew up. This recent devotional thought from “Connections” has come at a very timely moment. Yesterday, my younger boy, Glen, began the first day of his Army Boot Camp training. Over the next four months, Glen will be subjected to all the brutal rigors, intense discipline and strict authoritarianism that goes with entering into the life of being a soldier. He will need to be strong and also well-disciplined to keep his spiritual life maintained and healthy. So am I concerned or worried about Glen? Naturally! That is, as a father, I will of course be concerned about his physical well-being and safety as he trains to be a soldier. But I have committed my son into the hands of the Almighty God. And I will be sure to pray for him every day, even as I also pray for my older son Eric, and his young bride Esther, every day. As a Christian man, praying for my wife and all my children each day is as normal and natural as breathing air is, and is just as important. What is of greater concern to me is Glen’s emotional / psychological and spiritual health as he starts to enter into this world of the military. In a number of conversations in the past with Glen, it became clear to me that God had placed this desire within him to walk this path. I’m sure there will be some trying moments for him in the coming months and years ahead of him, but I do believe that Glen has a solid faith in God and a strong will to hold his ground if and when he is challenged. But it is not so much the blatant and obvious challenges to his faith that I worry about for Glen. No, it is more the quiet, subtle, slow drifting away from one’s “first love” for Jesus (as Revelation 2:4-5 puts it) that concerns me and has the possibility of causing a shipwreck to his faith. But not just to Glen, to any of us who do not choose to place a high priority on our commitment to maintain a regular and healthy relationship with God. This points to the importance of having an inner motivation to be proactive and disciplined about maintaining our relationship with God. It will not be easy for Glen in some ways, since the Army will in many ways control every aspect of his life at first. but he will get weekends off at some point, and he will have some personal time he can use to focus on his prayer life and devotional readings once he finishes Boot Camp. This brings me to a natural concluding point and question here. It is great when a person publicly declares that he is a Christian. But is that person’s faith truly grounded well in God and in His Words, so that no external force would have the strength to knock them down in their faith? Or are they hiding in the crowds of people who appear to make them strong but are empty and brittle like the bamboo stalks can get to be. And now it comes down to you, the reader of this article. How would you say that your faith is doing? Is your faith strong; is it really secure? Please, please do not drift slowly away from God, and risk the danger that you may experience having your Faith shipwrecked. Amen! During the past couple of weeks, I have been listening to a sermon series on “Faith”. My plan for the article for today was to continue writing out my thoughts and summaries of what I was learning from this sermon series. But something incredible happened this week that I just have to share with all of you. It is a story about how pure and persistent faith can overcome the obstacles that stand in our way. This story concerns my younger son Glen, and is the answer to prayers that we have been praying for many, many months. In a previous article ( which you can read here), I wrote about this strong desire that my son has had to be able to join the Canadian military, specifically the Army. And finally, two days ago, Glen found out that he had in fact been selected and will head off to Boot Camp as soon as they phone him and tell him what those dates are. To appreciate the magnitude of how great an answer to prayer this is, I will need to go back and give you a lot of the background details that led up to this moment. It was while our family was working in Africa in 2006 and ’07 that our son first entertained the idea seriously about joining the military. When we came back from Africa, and while Glen was doing his last year of high school, he was involved with the Army reserves. He found that fascinating and really enjoyed those weekends when they would go out on squad exercises, but it was too difficult to manage schooling and involvement with the military at the same time. So he put the idea of the Army to the side, finished high school, and then went on and completed a year of Bible college. As soon as he finished that one year certificate though, he went down and immediately applied to join the Regular Forces of the Army. There was the normal bureaucratic hoops and paper trails during that summer of 09, but by September, Glen was offered the opportunity to join at that time. And he knew that this was what he wanted, but part of him felt that he was not quite ready and so he passed up that invitation. One year later, our son was not only a year older, but just a little bit more ready to enter into the world of the military. He was told that he needed to start his application again, and all of us were quite surprised to find that there was a job freeze on the military and that he would be put on a waiting list. This began the long road and test of faith for all of us. Now I want to pick up the story from my perspective as a father. When Glen first started talking about joining the military, as a parent I naturally felt very concerned and worried for him. After having many talks with him, and after much thought and prayer, I arrived at the place where I felt okay about his desire. In fact, there came a day that God not only gave me peace about this decision, but also a conviction and assurance that this was the right thing for Glen to do. Over this past winter and spring, all of us in the family were actively praying that God would open up the door again for our son to be accepted back into the military. And every time that I talked with Glen, both of us felt that we needed to believe that it would happen, even though it seemed like all the odds were against it happening. It seemed like every time that Glen would phone the military, he would get different answers as to whether there were positions available are not. Then about two months ago, we got our hopes up when Glen was called in for an interview (which went well) and he also passed the medical exam. But weeks went by and there was no news. Finally, it looked like a breakthrough when a few weeks ago he was told that he was on the “Merit List”. The next thing we heard was that there were 80 applicants for the remaining 20 positions. What an emotional roller coaster we were all on, but again, we stubbornly chose by faith to believe that God would open the door and allow Glen to be selected. Then I remembered something that I had just heard and written about in last week’s article on faith. The speaker, Leon Fontaine, presented the idea that there are obstacles (i.e. mountains) in our lives, and that by faith we should speak, literally speak against these mountains to be removed. Again, this is not the idea of using words like magical incantations. But rather, it is a bold proclamation coming out from within of the faith that you hold to be true. And so, when they told us last week that this Tuesday was going to be the final day of selection, I felt empowered and emboldened within my spirit to lay claim to the biblical promise of Psalm 37:4, “Delight in the Lord, and He will give you the desires of your heart.” I knew that Glen had committed his ways to the Lord, and I also knew that God had given me in the past the peace and the conviction that Glen should join the military. Throughout the morning of Tuesday then, I not only prayed to God, but I prayed out loud to God to let this be the day that Glen would be accepted. What a great relief and joy I felt then, when Glen phoned at two o’clock in the afternoon to let me know that yes indeed, he had been one of the 20 who were selected to be accepted. All I can say now is, “Thank you, thank you God!” Just like the parable of the persistent widow, You showed us once again that when we have persistent faith in You, faith is rewarded.